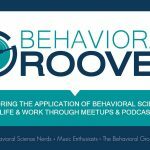 The happiness advantage – Behavior Matters! Tying into the video from yesterday, this presentation by Shawn Achor, author of “The Happiness Advantage” reminds us that we are fulfilled and happy, not because we are successful, but we are successful because we are fulfilled and happy. Again, we need to focus in on the journey. Take a moment to think about how this applies to motivation and to work? How do we instill happiness as a part of our job role? In the 1990’s, I was introduced to Appreciative Management and Inquiry as laid out by Dr. David Cooperrider. In his books he identified that many organizations and leaders focus in on the negative. What get’s attention in the business world, is not so much the successes, but when we make a mistake. Think about the last time you got a call from your boss or boss’s boss – was it when you achieved your sales target or when you missed it? Which had more salience for you? Organizations, Cooperrider contends, need to do a better job at focusing our thoughts and effort on the positive. When we look for the positive inside organizations (positive inquiry) we tend to find positive things. This reinforces our mindset and we start seeing the positive things all around us. Restating the line from Field of Dreams, “if you look for it, you will find it.” It is a reinforcement loop that helps us weather the downturns and firestorms that always occur. We all need to start looking for the positive things in our lives – both at work and at home. I start by trying to be grateful for something everyday. You can try it too. A big hearty thanks goes out to Bob Ebbers of Workplace Stars for sharing the Shawn Anchor video with me – as Bob said, “Enjoy this gem!” I couldn’t agree more! Leave a thought by clicking on the comment section below! Come on – its fun. I’ve read some excellent stuff here. Definitely value bookmarking for revisiting. I wonder how so much attempt you put to make this type of fantastic informative site.